Look, it’s tough trying to finish up Roster Recaps. This is our 366th middle reliever, give or take a few. I know reading about such luminaries as Matt Barnes, Brandon Workman, and Heath Hembree have certainly satisfied your insatiable appetite for Red Sox analysis. 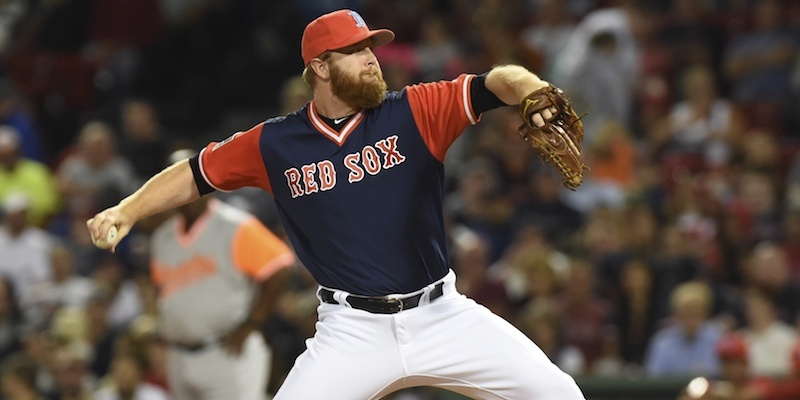 Now I must remind you that Blaine Boyer is a pitcher who indeed exists, was on the Red Sox 25-man roster for a not-inconsequential amount of time, and spent most of the season in the Red Sox organization. I’m actually a little bit surprised he’s still around myself. Over a year ago, Travis Sawchik at Fangraphs took note of a particular claim to fame Boyer had: batters couldn’t barrel him up at all. Sure, he couldn’t strike anyone out and he didn’t induce grounders, but getting weak contact? That’s intriguing. Batters can exert a ton of control over how hard they hit something, but can pitchers affect that? It’s something to look into, at the very least. The Atlanta Braves were willing to roll the dice on it, as they signed Boyer to a minor league deal with a spring training invite a mere four days after that piece was written. He nearly made it onto their 25-man, but was cut on March 25th. Boyer was scooped up by the Red Sox in mid-April on a minor league contract, got called up at the end of May, and has stuck with the organization ever since. He started striking people out. Boyer had a 9.2 percent strikeout rate in 2016 and it jumped all the way to 18.5 percent in 2017. Not many pitchers can more than double their strikeout rate like that, so that’s just a tad bit insane. One possible source of this was an improvement in velocity for his fastball, as his four- and two-seamers both saw at least a 1 MPH jump in their average velo from last year, while both his slider and curveball registered drops of at least 1 MPH. When your fastball sits in the mid-90s and your Uncle Charlie comes in below 74, you’re gonna catch some batters swinging early. Boyer was now 1) touching 95 with regularity and 2) getting more whiffs than ever before. Naturally, the contact rate dropped, and Boyer sure looked like a contributor out of the bullpen, especially when he first showed up. He couldn’t dodge barrels like Mario anymore. Boyer registered exactly 130 balls put in play against him, and he had the 231st-best barrel rate among all pitchers with 130 or more balls put in play against. There were only 375 qualified pitchers, so Boyer wasn’t even average. So if he wasn’t getting weak contact, what was he getting, exactly? A whole lot of nope. Of all the relievers that threw at least 20 innings for the Sox, Boyer had the lowest groundball rate by far, at 34.1 percent. He didn’t have the highest fly ball rate within those qualifiers, but he did have the highest line drive rate — at 29.4 percent. For reference, Joe Kelly came in second with 23 percent. Sure makes that .370 BABIP and 5.44 DRA look justified, doesn’t it? Left-handed batters crushed Boyer to the tune of a .919 OPS. Thankfully, he didn’t see many, but that wasn’t the only mark against him here. There wasn’t a leverage bracket here he really excelled in. His best work was during the 8.1 innings of medium leverage he had, but his strikeout rate would shrink back down to 9.7 percent in those spots, and make that .726 OPS against look really flimsy. A couple injuries turned him into a piñata in July and August, contributing to a terrible 11-inning stretch. A right elbow strain early in July produced a .900 OPS against until he was put on the disabled list on the 16th, and a neck strain affected his entire August, causing him to miss two weeks and saddling him with horrid 1.278 OPS against in that month. There’s a lot of BABIP inflation and small sample size warnings here, but with Boyer’s batted ball profile being what it is, it doesn’t seem like it’s entirely bad luck. Boyer is 36, is a reliever, and despite honest improvements in getting whiffs, his batted ball profile has taken a turn for the worse. That’s a recipe for disaster when it comes to projecting his next season. There’s some hope he can rediscover his barrel-avoiding magic that he showed in 2016, but that’s more of a pipe dream than anything. Expect very little out of Boyer in 2018, and cherish anything he does well. Wanting more than that will probably end in disappointment.